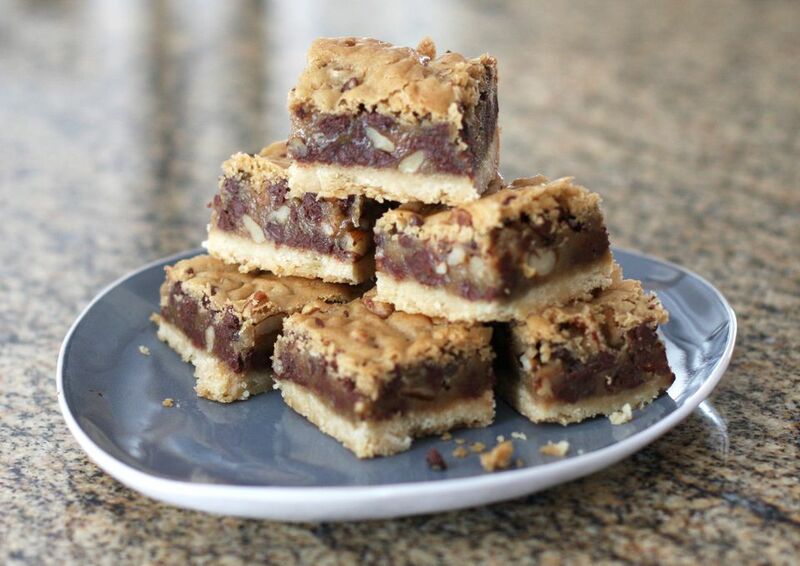 This brown sugar bar has all the gooey and chewy goodness we expect from blondies, and the shortbread crust holds them together and adds crunch. The shortbread crust makes these blondies buttery and extra special. Mini semisweet chips were used in the pictured blonde brownies, but regular chocolate chips may be used as well. Note: while there are multiple steps to this recipe, this blondie dessert is broken down into workable categories to help you better plan for preparation and baking. Heat the oven to 350 F. Lightly grease a 8- or 9-inch square baking pan. In the food processor, combine the crust ingredients and process until it clumps together. You could also use an electric mixer to combine the crust ingredients, just mix until the crumbs begin to clump together. Pat the shortbread dough into the prepared baking pan. Bake for 15 to 18 minutes, until lightly browned and firm. Let the crust cool in the pan on a rack while you prepare the blondie brownie topping. In a mixing bowl with electric mixer, beat the cooled melted butter and brown sugar until smooth. Beat in the egg and vanilla until well blended. Combine the 1 cup of flour, 1/8 teaspoon of salt, baking soda, and baking powder. Add to the brown sugar and butter mixture and stir until blended. Fold in the chocolate chips and pecans, if using. Spoon small amounts of the blondie batter over the cooled crust. Then carefully spread or pat to cover evenly. Bake for about 25 to 28 minutes longer, or until set and lightly browned. Cut the blondies into small squares when completely cooled.